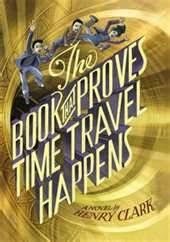 Going into The Book that Proves Time Travel Happens, by Henry Clark (Little Brown, April 14, 2015, middle grade), my attitude was not the best--I vaguely feel that I do not need to read any more books about kids travelling back to the 19th century US and facing the grim realities of slavery. Fortunately Clark is creative enough in his take on this premise to divert and entertain even jaded, cynical me. Young Ambrose Bordy (Bro), ordinary middle school child of an Irish father and African-Canadian mother, is being embarrassed by his dad even more than most adolescents are--his father has realized he is a "trans-temporal" person, one who is "not comfortable wearing the clothing of the twenty-first century." Which means his dad shows up to teach at his son's school clad as a Roman, or a Viking, or in some other hideously embarrassing outfit. And this is not only making Bro uncomfortable; its also putting great strain on his parents' marriage, and might result, if conservative members of the school administration have their way, with his dad loosing his job. Looking for a solution to this problem, Bro visits a fortune teller when the carnival comes to town...a visit that does indeed result in a resolution of his problems...after a harrowing trip back in time to the 19th century. The fortune tellers daughter, a Romany girl named Frankie, manipulates him into helping her find her family's great treasure--a trombone that can send people (as long as they have psychic gifts of there own) through time. Frankie has her own reasons for wanting to go back to the 19th century, and she had no intention of taking Bro and Bro's best friend, Tom Xui, along with her. 1852 is a challenging time to be a kid of color in the US, even in a northern state, and soon the kids fall afoul of bad guys seeking a quick buck by capturing and claiming as runaway slaves (I'm not sure that Chinese Tom would have been a target, but there it is). So the three of them have to free themselves, reunite themselves with the trombone, and get a hold of a first edition of Uncle Tom's Cabin (for reasons)....but when they do get home, they find they've altered the path of history (tying things back to the Trans-Temporal clothing issue), and have to go back and do it again. Some help comes from Tom's realization that the character of the I-Ching can be read as morse code (and the coded words are surprisingly, supernaturally, on target), and some help comes from an old friend of Frankie's family who just happens to be a surviving gigantopithecus. The secret of the I-Ching's morse code messages (and the point of the title) is made clear with a side trip at the end of the book back to ancient China, the sort of thing that always adds freshness to stories about 19th century America (sincere font). As you can guess from those last two bits of plot, this is not a Serious and Weight exploration of the evils of slavery, but more a wacky what the heck sort of surreal adventure. It's all a bit tangly, but is held together by the growing cohesiveness of the team of kids. And even though it is not Serious and Weighty, it does manage to work in some useful general knowledge, and a nice message about tolerating behavior that, though harmless, is disconcertingly different (trans-temp dressing). Thanks Karen (aka Ms. Yingling Reads) for sending this one on to me!